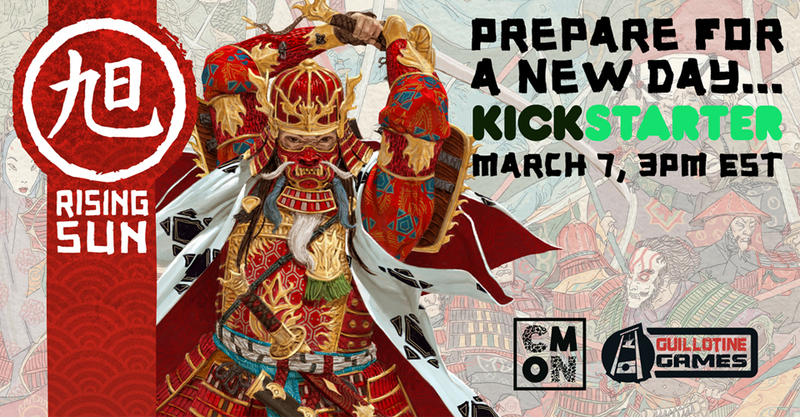 Well, the latest CMON Kickstarter has come to an end. Rise of Moloch did rather well, getting $1.17mil. But if you're not a fan of steampunk stuff, maybe that wasn't the game for you. Well, then you'll want to perhaps check out the next game hitting Kickstarter for the company. Those that liked Blood Rage will definitely want to check it out. Coming to Kickstarter on March 7th at 3 PM EST, Rising Sun is the spiritual successor to Eric M. Lang’s Viking epic, Blood Rage, and reunites the entire creative team behind it. Set in Feudal Japan, players assume the role of powerful Daimyos. They lead their clan with wisdom and diplomacy, but when the need arises, they won’t hesitate to jump into battle! Players will call upon the Gods for help, and receive the assistance of powerful monsters. It’s all fair game in the land of the Rising Sun.